I’ve seen so many wonderful pumpkin make-overs this season. Many of them, I look at and think, “Oh, how cute! I could follow those instructions.” Others I look at and think, “Wow, that’s awesome, but way above my crafting level!” This ribbon overlay is one of those that anyone with a pair of scissors and some thumb tacks can do. I did one a few weeks ago, but this one turned out so much cuter. 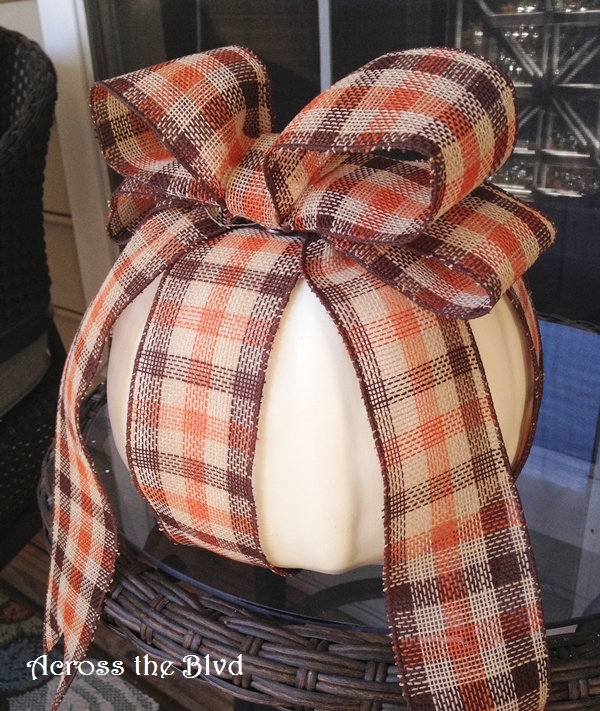 Gloria purchased some lovely plaid ribbon in fall colors that goes great with her decor. 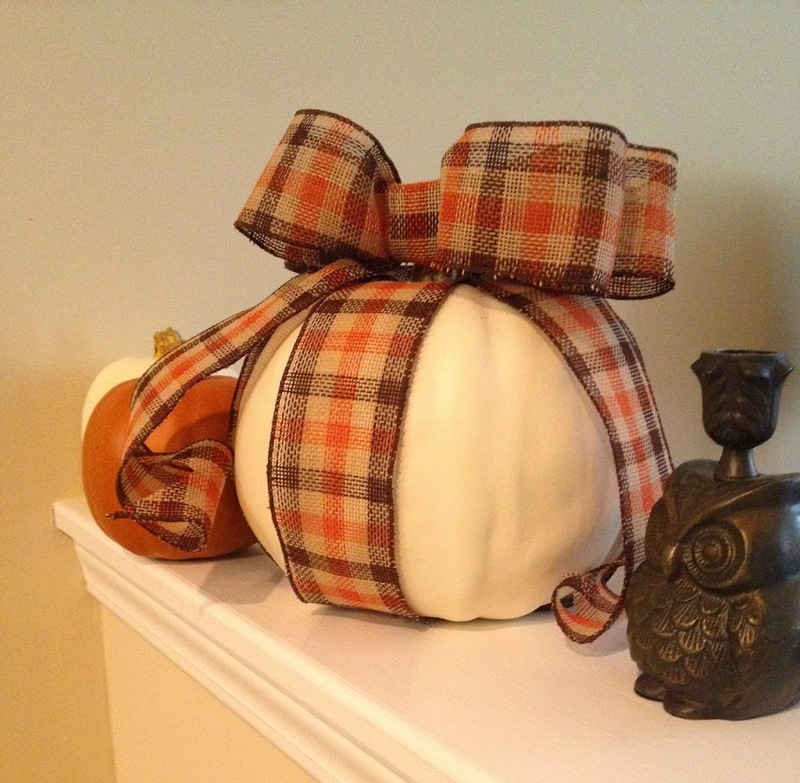 I was over at her place one evening and she showed me her pumpkin and the ribbon and asked me to do something with it similar to how I made the quick and easy pumpkin with ribbon for my mantel. After finding some brass thumb tacks, I was all set. This is truly a five minute craft! Searching for her thumbtacks might have added a few extra minutes! I used the same easy method I used for my pumpkin except I did a fancier bow for hers than I did on mine. Cut two strips of ribbon each long enough to wrap from the bottom around the sides of the pumpkin and up to the stem. Fold the ends under and secure with a brass thumbtack. To make the bow for this one, I cut one piece of ribbon 20″ and another16″ long. For the tail, I cut a piece that was 30″ in length. I cut a fourth piece 4″ long. I folded the longest piece to meet in the center and stapled it together and repeated for the 16″ piece. I located the center point of the 30″ piece and did an accordion fold to the middle of the piece then stapled it together. I folded the 4″ piece in half length wise from each side to the middle and stapled it together so that it was narrow enough. I placed the smaller loop on top of the larger one and placed the tail piece below the loops, then wrapped the 4″ piece over all of the other pieces. I stapled the excess of the 4″ piece in the back and trimmed it down a bit. I’ve got step by step instructions with pictures on how to make a similar bow on my Bows are Easy post. I placed the bow at the base of the pumpkin stem. This one is not attached to the pumpkin, but it sits nicely on top. A dot of hot glue would hold it in place. I have to say, the combination of the plaid ribbon and doing a better bow with loops really makes a difference. I’m liking this one so much more than the one I made for my own mantel. It looks great along with a couple of smaller pumpkins and her owl candle holder sitting on the pony wall. Have you lost count of the number of different ways to decorate a pumpkin? So many awesome ideas have been shared. I’m storing up lots of ideas for next year! Thank you, Shannon. My daughter gets all the credit for the choice of ribbon. She has good taste! 🙂 Very nice of you to stop by. I love this! Very pretty. It really caught my eye! Hello sweet lady! This looks incredible. Pinned. We appreciate you taking the time to party with us. We hope to see you on Monday at 7 pm. I love your white pumpkin with the beautiful checked bow. The fall colors all look wonderful together in your charming vignette. Love that owl candle holder. Thanks for sharing at the Southern Special. I love how this turned out. 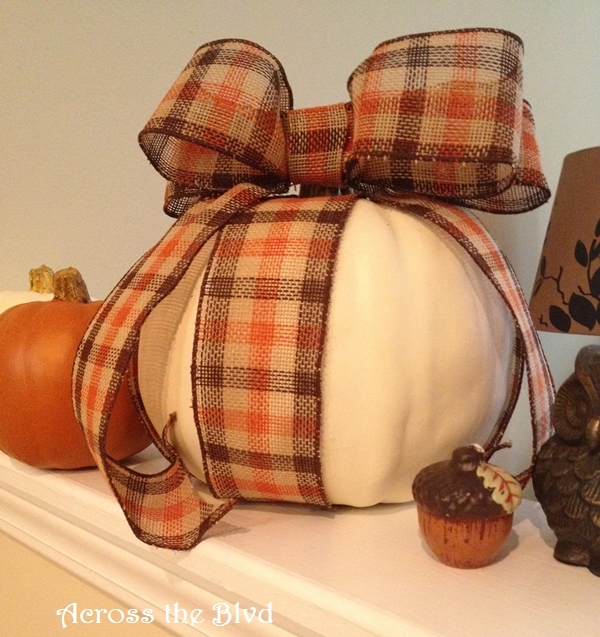 That plaid ribbon just gives the pumpkin so much character. Thanks so much for sharing this at The Southern Special. Thank you ladies for stopping by here. I’m enjoying all of your link parties. It’s such a great way to see so many new ideas.